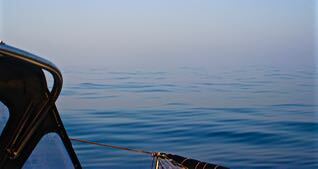 On the 12th of February we started Leg 3: from Las Perlas to Galapagos, 850 NM, approx 5 days. 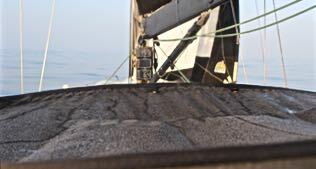 We had some issue at the start getting the multi-hull “Two Fish” bumping into our starboard side just before crossing the starting line cracking the hood of the dinghy’s motor and moving the bimi a few centimeters. 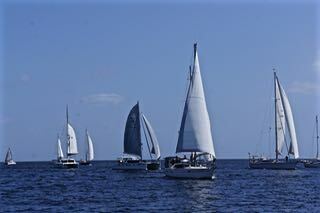 However we crossed the starting line as first boat! 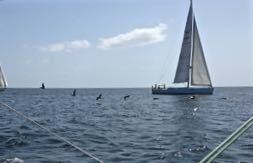 A group of beautiful pelicans flying through the whole fleet while leaving Las Perlas. 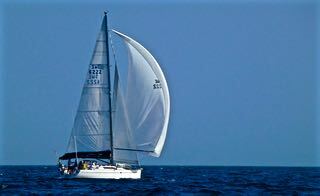 The first day we had a wind speed of 13-15 knots and a current of nearly 2 knots. 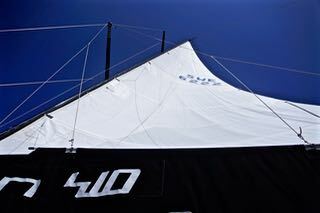 We flew the spinnaker and 24h later we hit our record of sailing distance of 214 NM!! 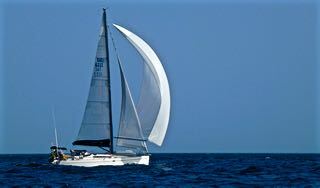 The second day showed to be the same and we hit 198 NM making it 412 NM in 2 days. 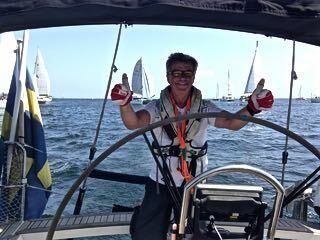 Amazing sailing, wind topping up to nearly 37 knots as well as falling down to 2-3 knots. 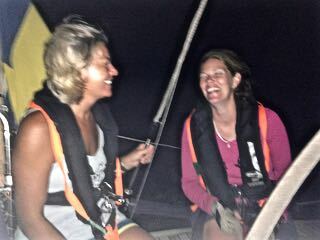 The third night the wind and the sea conditions were perfect for us to fly the spinnaker even during the night. Lovely! 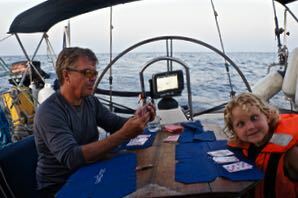 Janne and Nilla had introduced the card game “Vänd-tia” that the kids now constantly want to play. 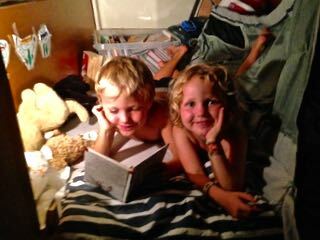 Alex reading for his sister. Approaching the Equator we felt through several nights how the air got more and more humid, especially at night. 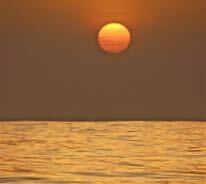 This picture is taken at sunset to show the humidity. 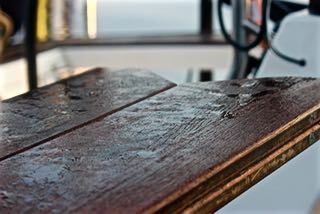 The table, the sprayhood and cushions are not humid, they are totally wet, only by humidity! 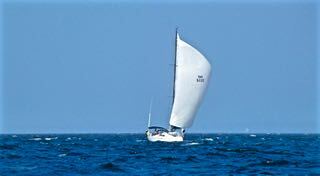 On the 15th of February we thought we were passing the Dold Drums as the wind dropped to 2-3 knots. 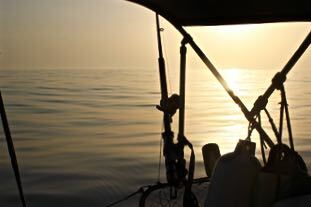 However we really entered the Dold Drums during the night of the 16th of February when the wind dropped to 0.00 knots! The Dold Drums is an area of absolutely no wind due to the winds of the North and South Hemisphere meeting creating an area of vacuum. The Dold Drums are moving here and there according to the winds of the North and South Hemisphere. 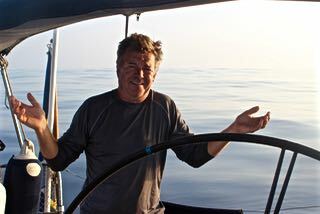 It is spectacular to see this huge sea totally flat, occasionally some old swells come in but that’s it! 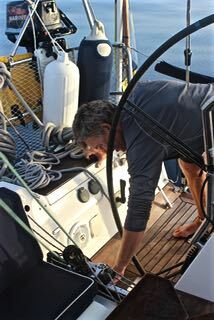 At 7h36 we gave put and through the engine on. 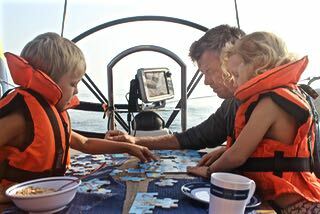 So now more time for laying puzzle with the kids! This is what it looked like the whole day. 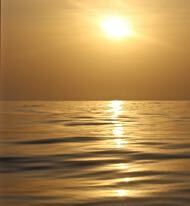 Flat, flatter and flattest!